A top Tobruk businessman is demanding a boycott of Tunisian goods after describing Tunisian customs as pirates for seizing containers from two Libya-bound vessels. Ibrahim Al-Jarari, chairman of the Tobruk Chamber of Commerce and Industry, last month called for a ban on Tunisian ships entering Libya ports. Now he is extending his demand to include Tunisian goods. 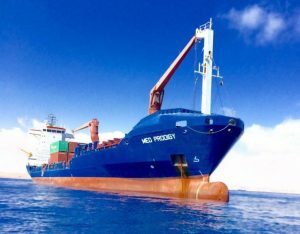 The problem appears to have begun when this February customs officers at the port of Sfax found some 25 million packets of cigarettes in 15 containers aboard the Panamanian-flagged Med Prodigy. Tunisia’s customs chief Adel bin Hassan was reported by local radio station Saraha FM to have hailed the customs’ seizure as the largest ever and said the cigarettes were worth $17 million. The Med Prodigy’s captain is alleged to have told customs officials the cigarettes came from Turkey and had been ordered by a Libyan businessman for delivery to Misrata. The vessel had sailed to Sfax from Valencia. According to MarineTraffic.com, it is still in the port nine weeks later. Tunisian customs has not explained if the shipping manifest for the containers was incorrect. However, Jarari insisted to Alwasat that the goods were not being smuggled, that the documents were not falsified and that the shipment was legal. Less clear is a second incident in March. This time Tunisian sources claim customs men intercepted another Libya-bound container ship at sea and escorted it to Tunis’ Rades port. There they allegedly found five containers full of Chinese-made sneakers. It is not thought that this vessel, which has not been named, was detained after the containers had been offloaded. Nor has it been explained how a shipment of sneakers could be so illegal that a container ship would need to be intercepted on the high seas by a customs cutter.